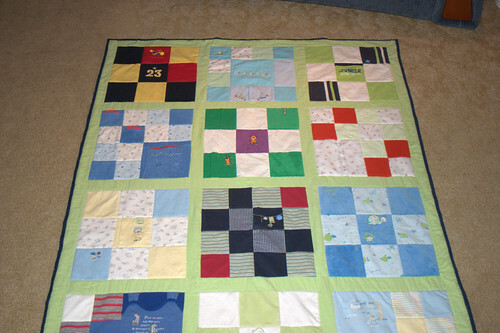 This was my first ever attempt at doing a quilt of any kind, so I was a bit unsure to start with. I did a bit of research online to see what others has done and came to a grinding halt. 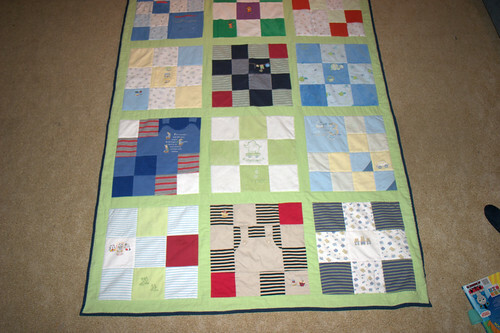 Although there was plenty of information about “normal” quilting, there was very little about using baby clothes and I was completely uninspired by the T-shirt quilts, so I had to fudge my way through it. I started off by studying the clothes, looking at the size and shape of any pictures or text on them to determine how big to cut the squares and also how big the blocks would have be to get the right size to cover the bed…yes, there was an awful lot of thinking involved this process! Once I knew what I was doing (ha!) I cut up the clothes (scary!) into squares slightly bigger than needed and then ironed on squares of fusible interfacing onto the ones in knit fabric for stability and to avoid stretching. This was quite a long process. I then used a template to cut to the correct size, trying to centre any detail where possible. Then it was the fun part of sorting them into blocks, stitching up (another long process) and arranging the blocks into some kind of pattern…yes, there was a lot of sorting, thinking and rearranging during this process too. 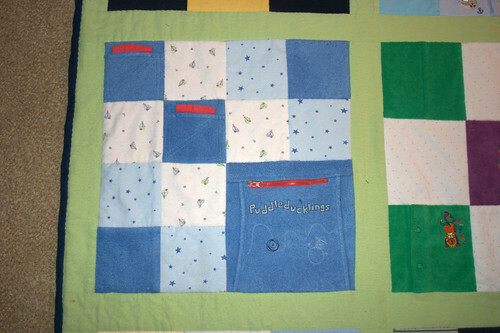 Once the piecing was done I made a quilt “sandwich” using some navy wincyette for the backing, and a layer of old fleece/sweatshirt fabric I had in my stash for the batting (I wanted something light – and really cheap). I tried to machine stitch around the blocks but the the wincyette fabric proved to be very unstable and kept moving and puckering all over the place. 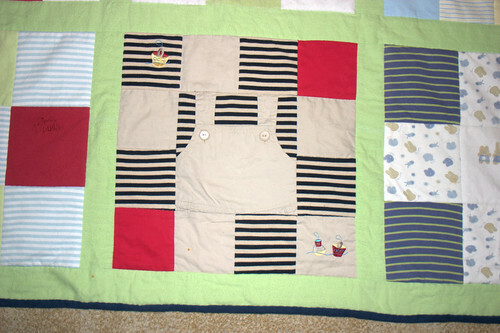 In the end I had to to quilt the whole thing by hand. Yes it took a long time. Luckily this was something I could do in front of the TV at night. I just stitched around the squares, didn’t bother doing anything fancy. I’m glad to say when it was finally finished Ewan thought it was just great. The first thing he did was get out his little toy cars and drive them along the sashing “roads” 🙂 How cute. 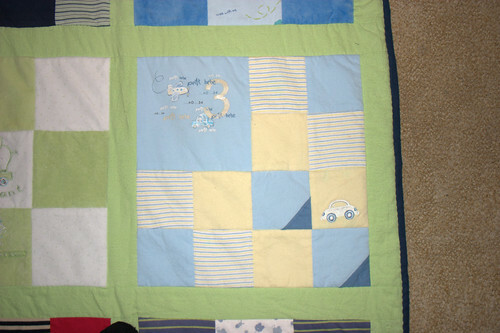 I am currently doing a quilt like this for my niece. 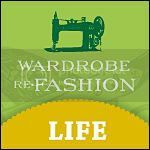 I had her clothes sitting around for about two or three years, and got started on it properly nine months ago. Like I said, its a long, slow process! 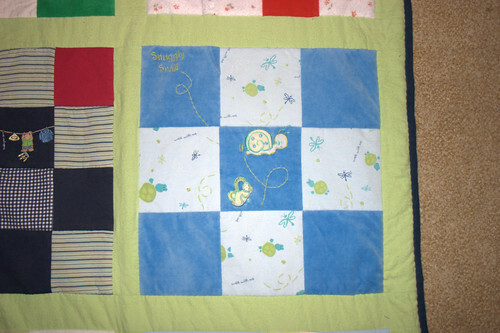 I am in the hand quilting stage at the moment and will post some pictures when it’s finished. This is fantastic, I love it! I knew there was a reason to hoard my 5 year olds baby things! !